Cheers to 2012! And Seattle! 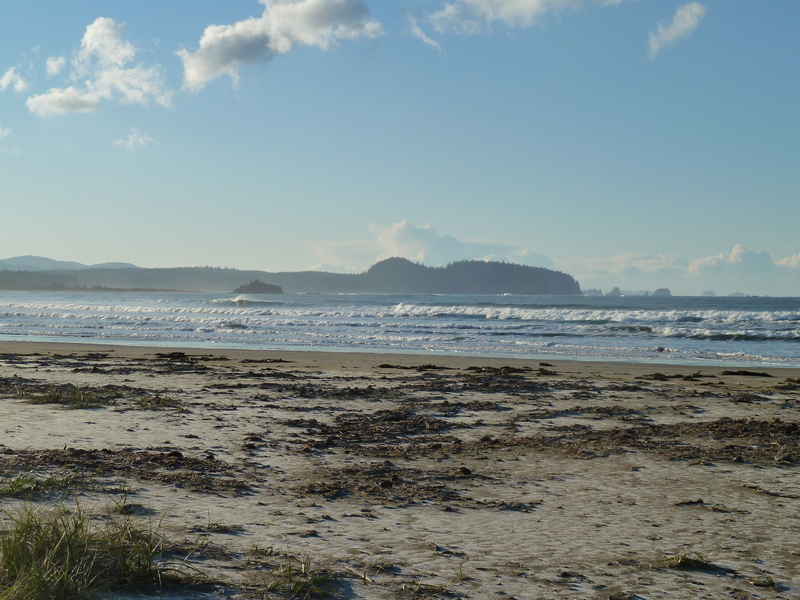 It was hard for me to write about Seattle in Seattle. No one in Seattle needs me to describe Seattle to them, I told myself. I also found that writing about Seattle was incredibly complicated. I tried a few times, but I didn’t know where I was going with the writing. Seattle is a city polluted by my memories and associations; I couldn’t take it in objectively. I thought I’d have a fresh perspective, but I quickly felt like I’d never left. I’d get on my bike and pretend I was a traveler visiting Seattle, like I was experiencing it for the first time, but my mind kept skipping to the past or the future. I’d be biking down Dexter, looking at the guys in Spandex, Arc’teryx jackets, soft shell booties, reflective vests, a million lights, shiny helmets, and bright panniers—and I’d start thinking about how much all that gear cost each of them. 1,000 bucks? Maybe more? Where are these guys biking to? Everett? Canada? The gear was the first thing I noticed when I got home. It was actually remarkably dry and mild during the two months I was home. There were a few times when the rain really started coming down while I was riding, but it was less than 5 instances out of the 60 days I was home. It doesn’t usually rain in Seattle, it sprinkles—and simple, inexpensive rain jackets can handle sprinkles just fine. I kept wearing normal clothes while cycling in Seattle partially to make a statement to the Dexter Spandex Guys, but mostly because it’s so much easier to wear one outfit for the whole day. I wasn’t the only woman out cycling the streets of Seattle wearing leather boots with heals, skirts and tights, nice shirts, and wool pea coats. I was happily surprised to see a few other women (and men) cycling sans bike gear. A few weeks ago a female co-worker decided to try wearing normal clothes on her ride to downtown from Fremont and she was almost euphoric about how much it simplified biking. I think she also found it satisfying to realize that she was doing the exact same thing the people with complicated bike gear were doing—getting to work. This co-worker hadn’t been biking recently because she doesn’t own winter cycling gear, proving just how powerful the Culture of Gear is as a barrier to increased cycling rates in Seattle. I don’t have anything against the Dexter Spandex Guys—really, I love them for cycling and together we’re hopefully making the Seattle roads a little safer. The problem I have with the Spandex Guys is that they make biking look so extreme and expensive. 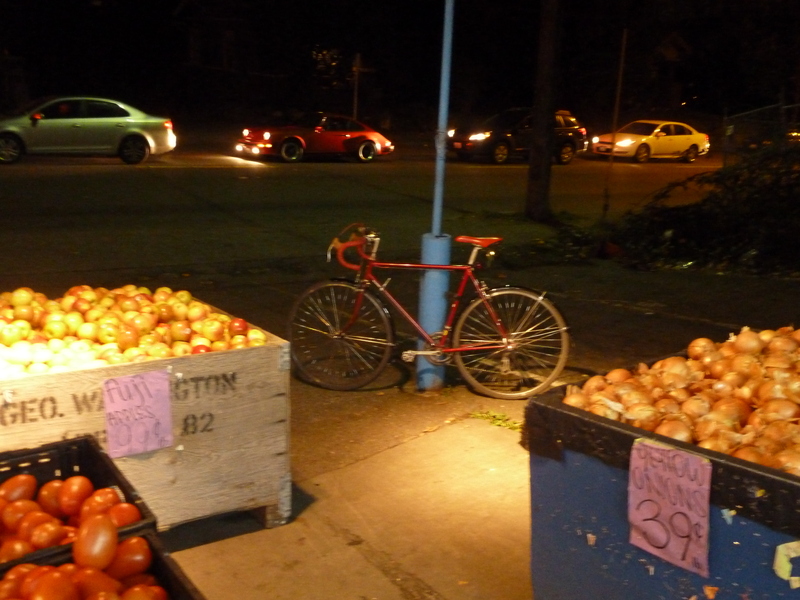 “Why can’t riding a bike be as easy as riding a bike?” asked Jim Davis hypothetically when I interviewed him in London. Sometimes, I would like to ask the Dexter Spandex Guys this same question. When I bike on Dexter I also look at and wonder about the Space Needle. Will the Space Needle ever start falling apart? Will it need to be taken down? Will there be a contentious political debate about what to do with the ailing Space Needle? Will one camp be in favor of a total rehabilitation while the other camp favors total demolition? Of course I had no idea babies were born up there, so he goes on to explain that every time the red light on top of the needle blinks—a baby is born! This seemed believable to me at the time and I guess my parents were talking about something else in the front seat (or didn’t want to get into a discussion about the origins of babies that night) because I went on believing that the Space Needle was a baby factory for quite some time. Long enough that at the age of 27 I still think about babies when that red light blinks. Seattle is my home and I think this makes my relationship with Seattle complicated in a number of ways. I have strange childhood memories about the Space Needle, for one. Also, sometimes I can almost physically feel the passage of time when I bike past a restaurant I went to for a friend’s 16th birthday. I remember the way things used to be and I feel nostalgic for them. I forget why Seattle is beautiful to visitors. I’m quick to find it’s flaws and feel disappointed by them. I didn’t do that in the other cities. I was always looking for the best in the other cities. I’ve left Seattle yet again and for the next six weeks I’m interning at a Danish consulting firm called, Copenhagenize Consulting. The firm is well-known for their behavior-change and marketing services related to active transportation. They also do bike master plans, analysis of health/economic/environmental outcomes related to increased cycling rates, and infrastructure design. It’s exciting to be back in Denmark, surrounded by newness, and I’m eager to temporarily join the ranks of Copenhagenize Consulting at 9:30 AM tomorrow. But, I’ve decided that my resolution for 2012 is to stay committed to Seattle. It’s kind of a half-baked resolution at this point, but I guess I just want to express my belief that Seattle is a city worth improving and investing in—and living in. I’m glad it’s my home, even if I’m hard on it sometimes. So, the first blog post of the year is dedicated to the best sides of Seattle (and the surrounding areas). What I like to call "Little Paris" on 1st Ave. 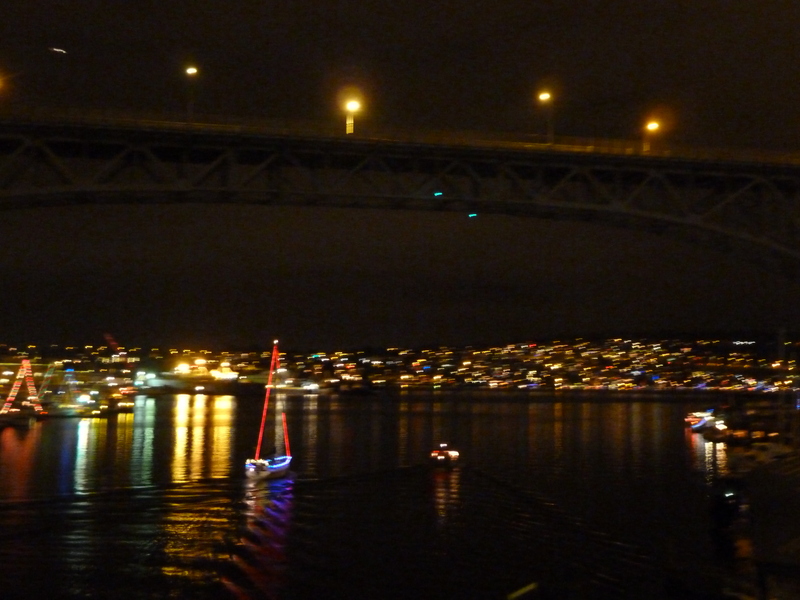 When the Fremont Bridge goes up, bikers get to check out the big, fancy boats that go by. 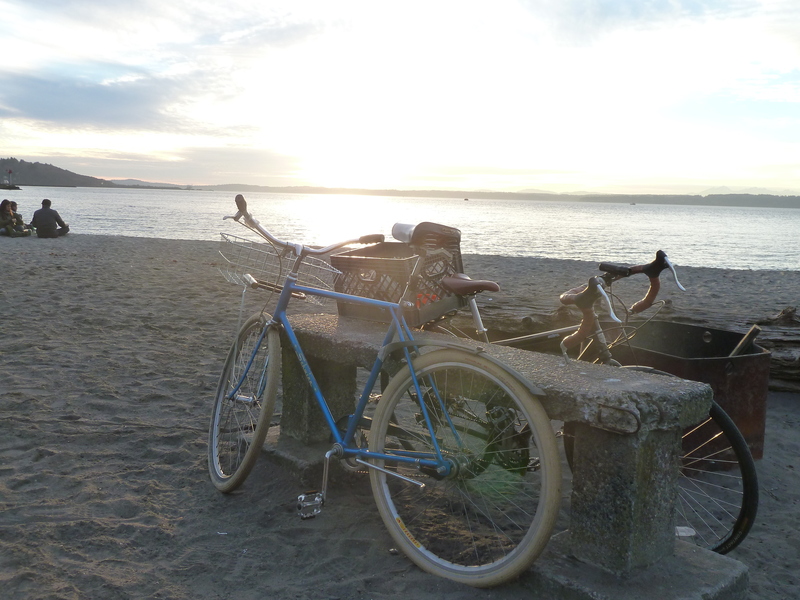 Christmas Eve at Golden Gardens. We took our shoes off and played frisbee in the sand. 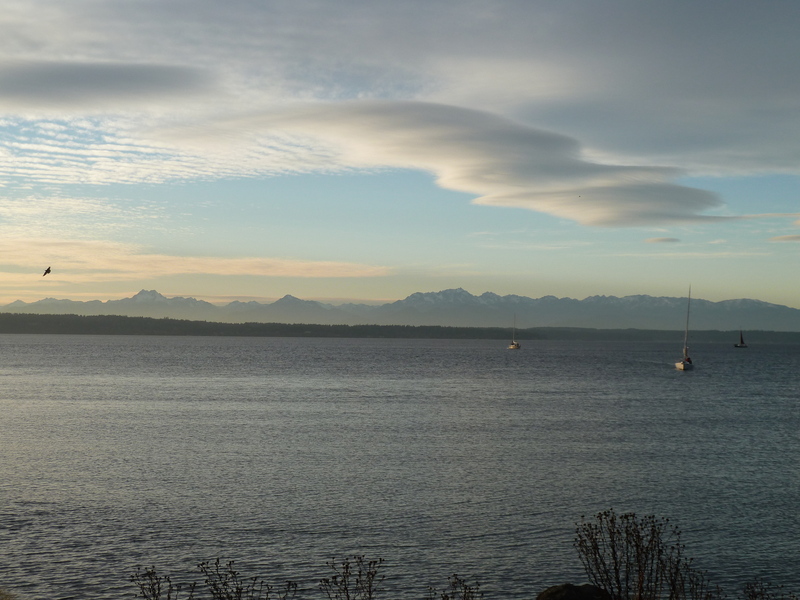 The view of the Olympics from Golden Gardens. 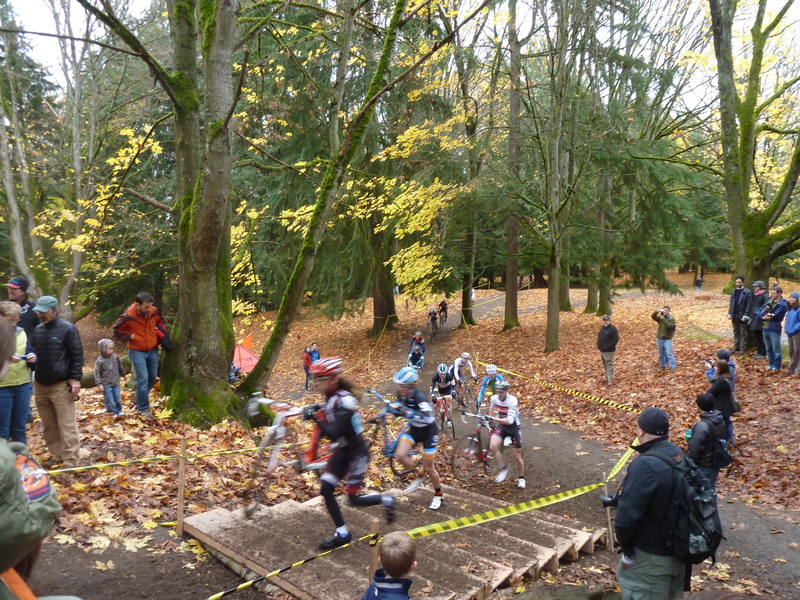 A Cyclocross race at Lower Woodland Park. 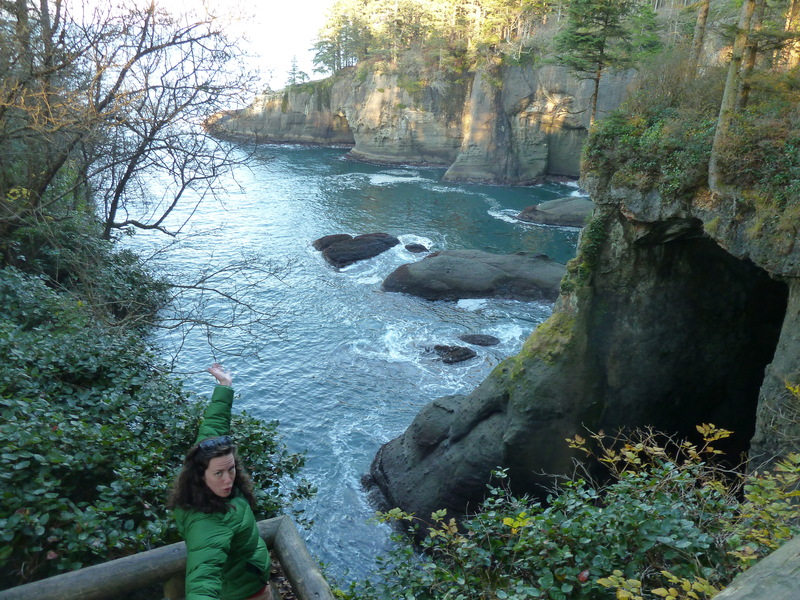 Cape Flattery. "You look so nice today!" 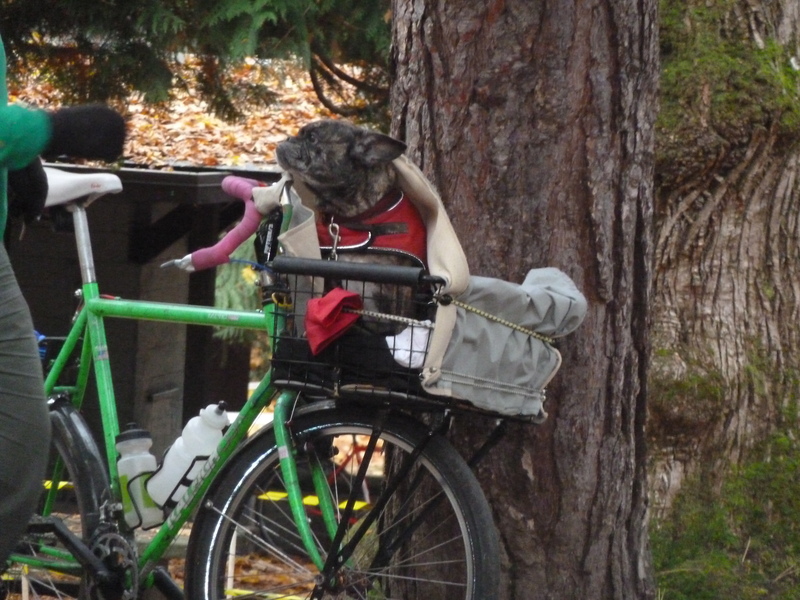 A dog in a bike basket near Green Lake. 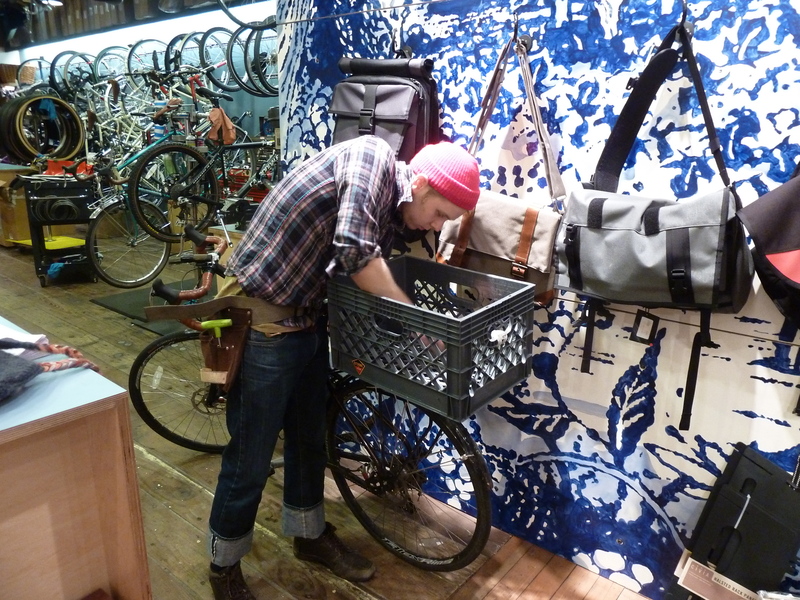 Bertha getting her new basket (a milk crate) put on at the Dutch Bike Shop. 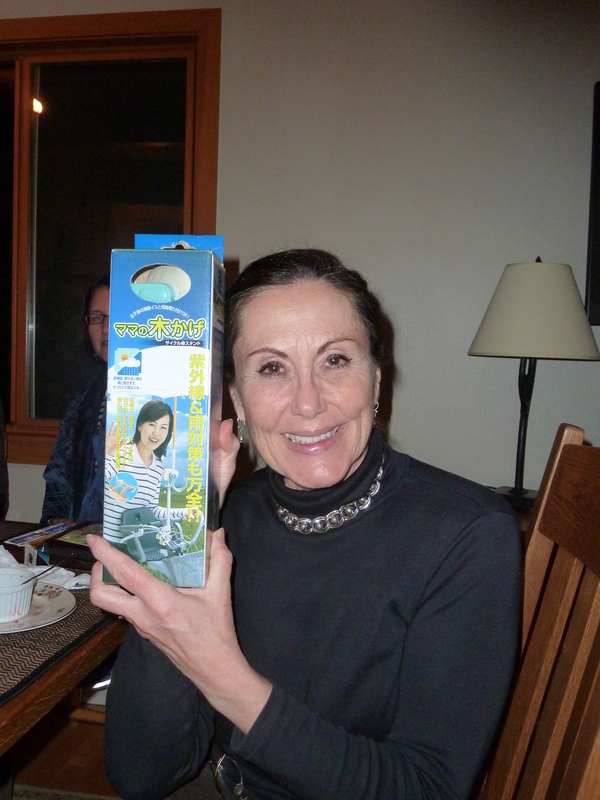 My mom with her new Japanese bike umbrella. Happy New Year to all! 2011 was a fantastic year; thanks for following the blog. I’ll be doing more regular updates now that I’m back on the road again finishing up my fellowship. Yes! Guest appearance on the blog! I’m glad you’re staying committed to Seattle and re-committing to the blog in the New Year. Miss you already, but I’m excited to read about your Copenhagen adventures. I came across your blog via Cycle Chic. As a former Seattleite I wish you well in your efforts to make that a better city for bikes. My adopted city of Valencia is rapidly becoming a bike town (although not fast enough for my likes). Happy cycling. P.S. 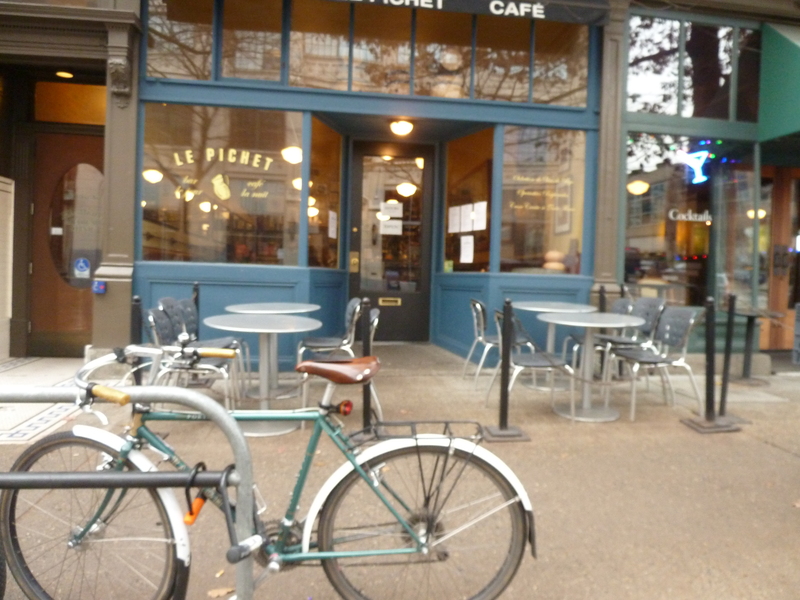 I stole your pic of Le Pichet, one of my favorite bars back when I lived in that hood.